Mr. Matt Schmidt is the Superintendent of Bangor Township Schools - the second largest district in the Bay Arenac ISD - serving close to 2600 students. 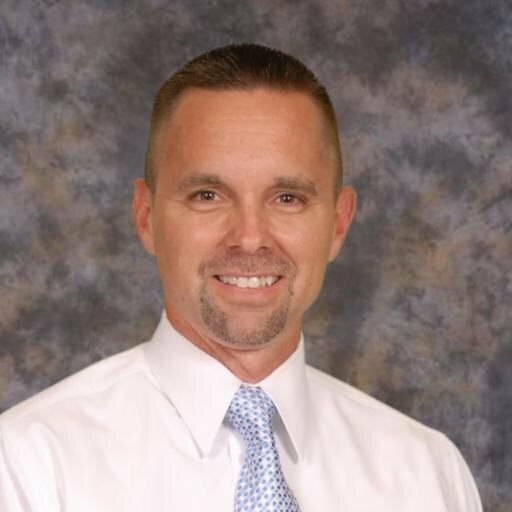 Mr. Schmidt has been the Superintendent since 2013. The Superintendent oversees the day-to-day activities of the District, while working closely with the Board of Education to carry out the district vision, mission, and goals. Prior to arriving in Bangor Township Schools, Mr. Schmidt was a middle and high school teacher for 14 years, as well as a middle school principal for 5 years. From the Superintendent's Desk to the Bangor Township Schools Community. We hope you enjoy our latest video spotlight - highlighting some of the great things happening in and around our district. We hope you enjoy our first ever video spotlight - highlighting some of the great things happening in and around our district. The start of the 2018-19 school year brings with it back-to-school excitement, lasting memories to be made, and friendships to be found and built upon. It also brings a renewed focus on school safety, as we know that our number one goal is to keep all students and staff safe. In Bangor Township Schools, from the school board and the employees, we are putting new safety measures in place in order to be ready for the return of students and staff. One of the first safety measures that we are implementing this year is the addition of a school resource officer for the district. We are partnering with the Bay County Sheriff’s Office to house an officer on the campus of John Glenn High School and Christa McAuliffe Middle School. However, the officer will be servicing all buildings in Bangor - educating students and staff on school and internet safety, being a resource for all safety issues, as well as being a presence at our buildings and at events. With all of the safety concerns around the nation, particularly in schools, the addition of a school resource officer is a must. Another safety measure we are putting in place deals with the hardening of our entrances and location of the offices at our buildings. The State of Michigan recently approved $25 million in grants for school districts to apply for in order to address safety issues in their districts. We will be applying for this grant in hopes of getting state dollars to help us better locate the offices in our buildings and to redesign how the public accesses our buildings and offices. A third safety measure we will be implementing this year is a new visitor system at all our buildings. We piloted the system last year at Bangor Lincoln, and it worked very well. This is something we must do in order to control the access the public has to our schools and our students. Be patient, as this will be a new initiative, but the payoff is a much safer system that will better protect kids, while controlling who is entering our buildings. Lastly, our entire staff will receive another round of school safety training when they return to work this year. The training will be followed by an active shooter simulation in the building by The Michigan State Police SWAT team (no students will be present). The training and simulation are another much needed step in our continued focus on being better prepared if a safety issues arises. Please know that we are committed to keeping all students and staff safe, and we are allocating the necessary time, training, and resources toward this commitment. Through our partnerships with the Michigan State Police and the Bay County Sheriff's Department, we have been able to focus our efforts toward hardening our buildings and better protecting students and staff. We take pride in our district, and we strive to provide the best experience to all our students and families, and it all starts with keeping everyone safe. If you should ever have a question, concern, or idea regarding school safety, please do not hesitate to reach out to me. In an effort to better communicate with our Bangor Township Community, we will be transitioning to a new website in the month of April. We will also be launching a new mobile app to go along with the new website. The app will contain the most up to date information regarding athletics, food menus, news, and so much more. Be sure to download the app to your Android or IOS supported mobile device to keep updated on the go. The new site will be integrated with multiple social media platforms, which will allow us to push out a common message to our stakeholders. We will also be able to send out push notifications to mobile devices. Should there ever be a safety issue in our district, or if we need to communicate a pressing issue to users, the notifications feature will allow us to get a message out to all users that have downloaded the app and allowed notifications form BTS. It is our hope that the launch of the new website and mobile app will further show our commitment keeping an updated and informative digital footprint for all of our users. We hope you like the new look, and we encourage you to browse the new website and to download the new mobile app. With another holiday season upon us, it is important to give thanks for all the things that make Bangor Township Schools the premiere school district in The Great Lakes Bay Region. We have come a long way in our 50 plus years of existence, and our success is due to so many incredible individuals and families that have passed through the doors of our schools. It is also due to the never ending support our of community - those families without children and our senior population that, in spite of no longer having children in our schools, continues their unwavering support for our schools and our students. Lastly, no school district would be as successful as ours without the steadfast support of the business community in Bangor Township and the surrounding Bay City area. Without their continued support, we would not be able to offer as much of a total educational experience to our students as we do. Together, we all work seamlessly to provide wonderful academic and extracurricular opportunities for all the students we serve. I speak for the entire staff of our school district when I say thank you to all of our stakeholders - together we have made Bangor Township Schools the premiere school district in The Great Lakes Bay Region. Hopefully, during this busy holiday season, you will have time to flip through our December edition of The Report Card. Inside the pages of our quarterly publication you will see the amazing things that are taking place in our classrooms and in our buildings - students achieving at high levels, experiencing new learning opportunities, and building communities of trust in their classrooms. You will also see the parents and community members who, on a daily basis, engage with and support our students. It is because of their support and willingness to do their part for kids, that new relationships and learning opportunities arise. Together, we do accomplish more, and our school district is exceptional because of our willingness to work together and support every child in their learning. From all of us in the Bangor Township Schools to all of you in our community, we hope you have a safe and memorable holiday season. We certainly give thanks to all that you do to support our mission of providing a quality educational program for all our students.